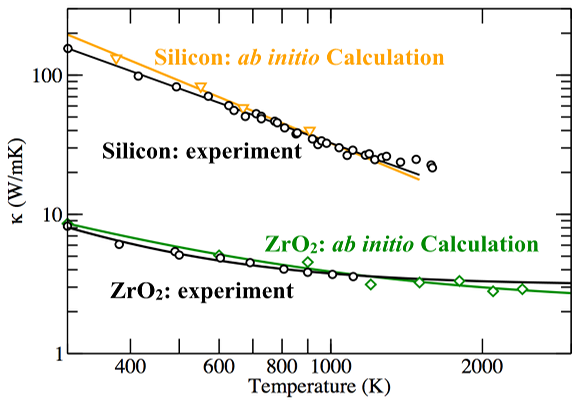 Figure 1: Non-perturbative, ab initio calculations (density-functional theory) that reproduce and explain the thermal conductivity of silicon (heat conductor) and zirconia (ZrO2, heat insulator). Adopted from C. Carbogno, R. Ramprasad, and M. Scheffler, Phys. Rev. Lett. 118, 175901 (2017). Experimental knowledge about the heat conductivity of solid materials is rare, but critically needed for many industrial and scientific applications, ranging from semiconductor technology to aircraft turbine engineering. For instance, zirconia-based thermal barrier coatings have driven the fuel-efficiency improvement in turbines over the last 30 years. From the theory side, an accurate and predictive assessment for the whole range of possible materials had hitherto remained elusive. At elevated temperatures, for instance, the interactions and dynamics of the atoms becomes so intricate that it can no longer be described by approximate, perturbative approaches – as employed in existing heat transport calculations, so far. of the thermal conductivity tensor for all kind of materials.